A white, ginger Brummie called ‘Dave’ in charge of the local Mosque, a daughter busy with being holy who really goes to nightclubs more than Kate Moss), a son-in-law who’s a moron and a soon-to-be mother-in-law with a superiority complex. Welcome to the fresh, wonderful, yet faintly familiar world of Citizen Khan; a sitcom about a British Muslim family. Let’s be clear: on paper, this is the most traditional sitcom you could possibly conceive. From Married with Children and The Simpsons, to Keeping Up Appearances and My Family, the basic formula for a family sitcom is right there, front and centre. And, like many of TVs staple sitcoms for decades, this family sitcom is filmed in front of a live audience. Yet this is the sitcom, which on paper could be stale and dull, that gathered several hundred complaints for allegedly mocking Islam. 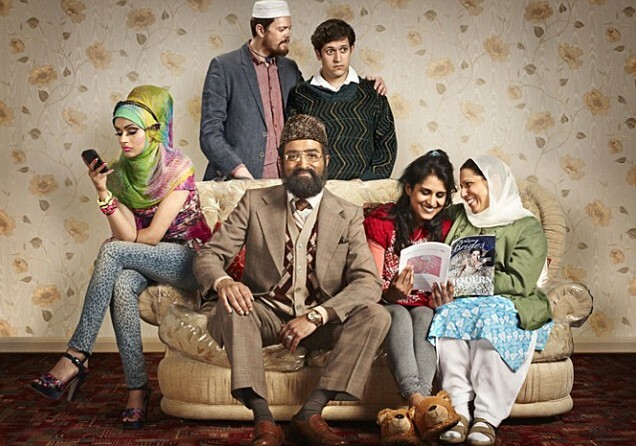 Does the sitcom demean Islam? No. Is it stale and boring? Not by a long shot. Already commissioned for a second series (before the first has even finished airing), Citizen Khan quickly established its characters and a rich world. The show hit the ground running. While many fantastic comedies understandably need time to fully get into their groove (Peep Show, The IT Crowd and Harry Hill’s TV Burp to name a few), Citizen Khan managed an impressive feat. While the comedy in the first couple of episodes touched now and then on the safe and, admittedly, the tired, these were just outliers. Mr. Khan buying his whole family a ‘holiday’ pilgrimage to Mecca by accident as he tried to have a room at the Mosque named after him was brilliant. Smuggling the TV out of a women’s prayer room, during prayer, to mourn a recently deceased husband just so Mr. Khan could watch the cricket, was superb. Having his mother-in-law start praying to Mecca the wrong way, only to have Mr. Khan spin her round, mid-prayer, on her prayer mat, was also hilarious. So, why the controversy? Ultimately, this is new subject matter. The first of its kind in the UK. It was destined to ruffle a few feathers. In fact, it’s format is smart. What the traditional sitcom format gives is a solid, tried and tested starting point to explore a new area. Honestly? I’ve yet to spot a joke that makes fun of Islam rather than the characters. Contrary to a review in the Metro, a mother-in-law that “prays indiscriminately” is not offensive to Islam but a joke on her faculties. She is the punch line, not Islam. No jokes “sail dangerously close to the boundaries of political incorrectness” either. And, frankly, if Caroline Westbrook at the Metro thinks there are she can point them out. http://www.metro.co.uk/tv/910618-citizen-khan-was-not-so-much-offensive-as-offensively-unfunny. Anyway, the point is Islam as a religion is untouched. That said, freedom of speech allows comedy to hold sacred cow beliefs to account. I think that can only be a good thing that furthers understanding by posing questions to religion. Citizen Khan doesn’t do that, and I am not suggesting it is the right vehicle to do so. It does, however, hold a mirror up to the humans interpreting the deity, highlighting sexism in Khan’s local Mosque. Like all comedy, in one way or another, it’s rooted in the ludicrous and the hypocritical. What better subject matter than status then? The second series is something to look forward to. Established, the comedy can now soar. It’s not at the level of The IT Crowd or Father Ted in its comedy yet, but it certainly has the potential. What would be nice is more of the supporting characters; Mr. Khan’s friends and his daughters. Stories centred on other characters would also be great. Most episodes of, say, American Dad have an A and a B story. The A story may be Stan Smith, the father, trying to stop his wife killing George Clooney, while the B story could be Roger the Alien setting up a vineyard manned by orphan children before he’s rumbled by child protection, who promptly take the children away. He doesn’t care though, because the wine they made was terrible. And yes, it is a surreal show. They manage that in only 20 minutes. Citizen Khan probably has over 28. And the supporting characters are superb. Riaz, in particular, is a character worth exploring. Spending her evenings out at the Mosque – READ: on a night out – her parents think she’s a prophet. Seeing the contrast with her reality would be brilliant. If you are in the UK try BBC iplayer. The DVD is also available on Amazon:Citizen Khan [DVD] or in your local DVD store. So you have no excuse not to watch such a fantastic show!